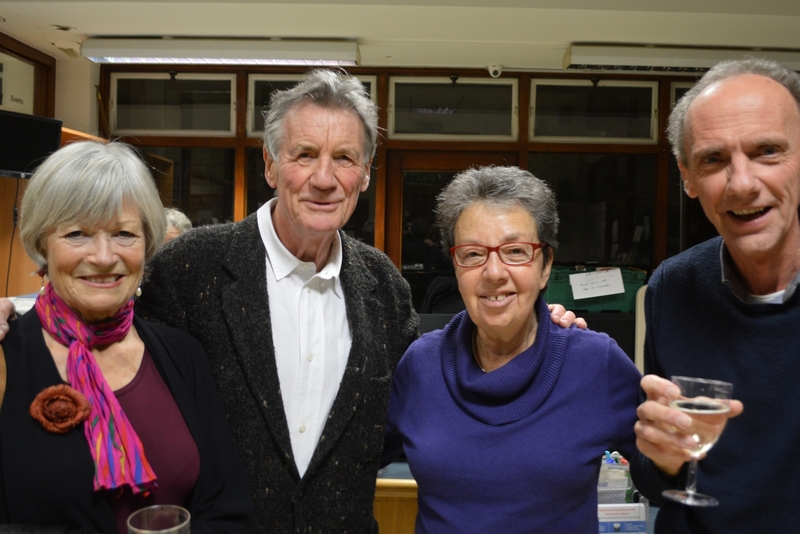 Latest news, views and events from Primrose Hill..
At the fifth anniversary of the Primrose Hill Community Library Film Show, Michael Palin came to introduce Life of Brian. Seen here (above), before his characteristically witty speech is Michael, with Annabel Leventon, Pam White, film show organiser and Colin Ludlow, film programme director. 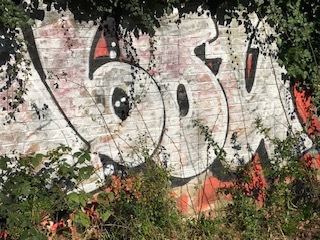 The amount of graffiti in Primrose Hill has increased in recent months, but particularly in the park itself near Elsworthy Terrace. Illegal moped and bike riders, drug dealers and gangs are accessing the park from the Elsworthy Terrace gate which is a hidden cul-de-sac. Drug use occurs there at night and violent crime is on the rise. In the hot summer last year a row of 18 inch shrubs were planted as a deterrent to the graffiti, but were never watered so unfortunately didn’t thrive. No fast growing ivy was planted which had been requested. It took residents’ six years to get approval to plant ivy and prickly bushes further down the wall and local residents are hoping this stretch will be planted sooner rather than later to prevent further graffiti. 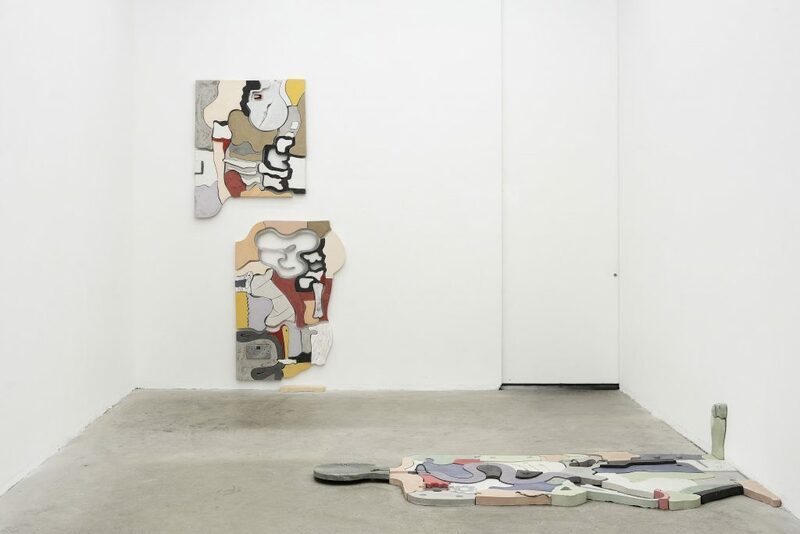 Freeland Foundation has an exhibition, Fault Lines, curated by Edward Ball, which brings together four UK-based sculpture based artists: Angela de la Cruz, Alice Channer, Jonathan Baldock and Holly Hendry. The artists all explore instability, both as an emotional state and in their work. They were born across four consecutive decades, highlighting an on-going and cross-generational fascination with the theme of flux. Fault Lines comprises mainly recent work, alongside a 2002 piece by Angela de la Cruz, which was featured in her 2010 Turner Prize exhibition. Fault Lines can be seen at Freelands Foundation (113 Regent’s Park Road) until 14 April. On Monday 26th February Camden Council planning department moved to refuse permission for the installation of an array of solar panels on the south-facing roof of St. Mary’s church, Primrose Hill. The proposal was designed to provide sustainable energy for the church and create surlpus renewable power to be sold back to the grid creating extra revenues to help fund the vital community projects run by St Mary’s. The plans had been carefully considered by the applicant to have minimal effect on the visual environment surrounding the site but planning officers ultimately decided that conservation concerns took precedence over the need to address climate change. This in spite of Camden’s own ambitions to cut CO2 emission by 40% in the borough with a deadline of 2020 as contained within their Local Plan. The vicar of St Mary’s Marjorie Brown reacted to the decision “I am dismayed that the proposal which is in line with the church’s commitment to caring for the environment has been turned down on aesthetic grounds. I am also surprised because the local community have given the project wholehearted support. Their views do not seem to have been taken into account by the planning department”. A huge groundswell of support had been expressed by upwards of 400 local people who had signed a petition and commented directly on the application. These included our ward councillors and MP Keir Starmer. Keir said at a meeting where he signed the petition that he thought these type of initiatives should be embraced and encouraged as sustainable energy is one of our best chances of ensuring a stable climate for future generations. He also stated the importance of public buildings leading the way in this renewables revolution. Councillor Richard Cotton made this comment “If this application were to be refused it would fly in the face of our environmental policies”. Despite the overwhelming expressions of support for this project the planning department agreed with the views of only 2 objectors to the scheme. Calls have been made for Camden Council to declare a borough-wide climate emergency which would have significant implications for all aspects of how we live and take action to improve our environment. Had such a measure been in place while this application was being considered the outcome may have been very different. Local celeb Lanah P includes Anohni’s Today I Am A Boy in her set. Anohni is an English-born singer, composer, and visual artist formerly known as Antony, the lead singer of the band Antony and the Johnsons. The song proved to be a favourite with audiences, whether in cabaret, concert hall or rockers’ pubs. Because of its popularity in this climate of gender transgressions, Lanah has recorded it with Norwegian musician Brudin accompanying her on piano. The video was shot by David Ryder Prangly. It will be available on YouTube on April 14 and is Lanah’s tribute to new beginnings, peace and prosperity for all.